Emanuel Gat was born in Israel in 1969. 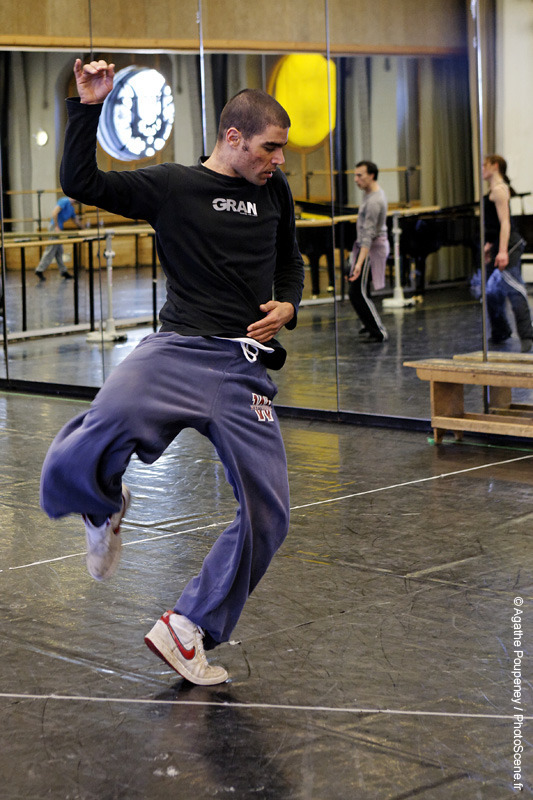 His first encounter with dance was at the age of 23 during a workshop led by Israeli choreographer Nir Ben Gal. Few months later he joined the Liat Dror Nir Ben Gal Company with whom he toured internationally. He started working as an independent choreographer in 1994. Ten years later, Emanuel founded his company Emanuel Gat Dance at the Suzanne Dellal Centre in Tel Aviv, with whom he has created several pieces of which “Winter Voyage” (2004) and “The Rite of Spring” (2004) won a Bessy Award; “K626” (2006) and “3for2007” (2007), before choosing to settle in France, at the Maison Intercommunale de la Danse in Istres. “Silent Ballet” (2008) was the first piece created in France, followed by “Winter Variations” in 2009 and “Brilliant Corners” in 2011. In 2013, Emanuel Gat was associated artist to the Montpellier Danse Festival for which the company developed the project "Up Close Up" proposing two new works : “The Goldlandbergs” and “Corner Etudes”, a photographic installation “It’s people, how abstract can it get ?” and a choreographic event “Danses de Cour”. In 2014, Emanuel Gat creates "Plage Romantique", a one hour work for 9 dancers, in the Agora courtyard during the 34th Festival Montpellier Danse. Emanuel is associated choreographer to Montpellier Danse Festival for the seasons 2016-18 and has presented “SUNNY”, a choreography for 10 dancers in collaboration with musician Awir Leon who is playing live. In 2017, Emanuel presented his second project as part of his residency at Montpellier Danse, which included two productions: a unique collaboration with the Ballet de l'Opera de Lyon, “TENWORKS (for Jean-Paul)”, a program of ten short new pieces mixing dancers from both companies; and “DUOS”, a series of duets presented at different public locations around the city of Montpellier during the festival. In 2018, Emanuel collaborates with the prestigious Ensemble Modern and creates Story Water at the Cour d'Honneur during Festival d’Avignon. Gathering 12 dancers, 13 musicians and a conductor, Story Water examines the space between dance and music, with Dérives 2 by Pierre Boulez for the first time in the choreographic field. The score is also composed of Fury II by Rebecca Saunders and FolkDance, co-composed by the Ensemble’s musicians and Emanuel Gat. Emanuel is associated choreographer at the National Scene of Albi in 2016 and from the season 2018-19, he is associated choreographer at the National Theater of Chaillot in Paris, for three years. Emanuel is regularly invited to set his work and create new pieces for dance companies around the world, including the Paris Opera Ballet, Sydney Dance Company, ICK Amsterdam, Tanztheater Bremen, Le Ballet du Grand Théâtre de Genève, Ballet de Marseille, The Royal Swedish Ballet, Polish National Ballet, Ballet de Lorraine, Cedar Lake, Ballet British Columbia and Ballet de l'Opera de Lyon among others. "Emanuel Gat masters his very personal art of choreography like a science whose boundaries he keeps pushing further and further beyond to translate ever-subtler meditations." "[…] The asset of Emanuel Gat, besides his energy, is obviously his talent: the extraordinary velocity of his dance; the permanent challenges that he gives himself and raises with sovereign elegance. When many others gargle with concepts before even knowing how to put one foot in front of the other, the rigor of Emanuel's beautiful, bewitching and thoughtful writing makes him a rarity: an authentic and brilliant choreographer, combined with a magnificent dancer."